Target selection:we ask you which level you aim for at Japanese grammar,vocabulary,pronunciation, Native level or comprehensible level. If you select 『comprehensible level』, Your conversation partners don't correct it very much as long as she/he can understand what you are trying to tell. You can take our online lesson with a different teacher every lesson. If you like, you can take it with the same teacher. If you like to take next lesson with a different teacher,you need to reserve it by 13:00 P.M on 2 days before the lesson day. If you take next lesson with the same teacher, you can talk with the teacher and reserve it. We recommend the learning method below. We recommend you should learn basic Japanese with E-learning materials below we are providing for free before practicing your Japanese with our Japanese private teachers/language exchange partners. To learn language efficiently, you need to learn its language's basic grammar and basic vocabulary at first. We recommend you should practice your Japanese as much as possible with our Japanese private teachers/language exchange partners. Please apply for our service through the application form at the bottom of this page. Introduction fee 5,000 yen ⇒ 0 yen if you apply for this service by the 31th December. We recommend you should regularly check your Japanese skills by taking our online interview. You can take an online interview with a Japanese language teacher below. self-introduction I have experience to teach Japanese at Japanese language institute for more than 3 years and teach business Japanese at trade company. I am familiar with JLPT,too. StepⅠ:We arrange an online interview for you after we accept your application form at the bottom of this page. 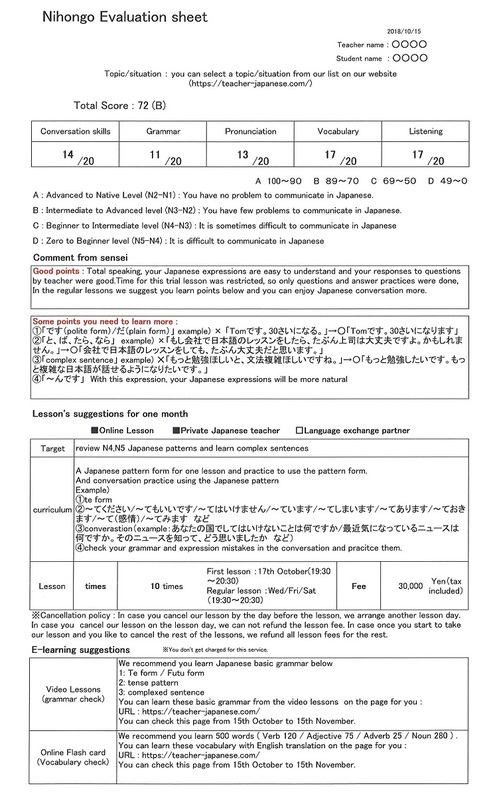 StepⅡ:After an online interview, we give you an evaluation sheet(your good points and some points you need to learn more) and suggest you a lesson Curriculum(schedule) and which service(Private Japanese language teacher or language exchange partner or Online lesson) is better for you. ※Please note that if we judge you are less motivated to learn Japanese language,we can not provide you with our Japanese language teacher/language exchange partner's introduction service. You can take these lessons as much as you can take for 1 month. After one month, if you continuously like to take this regular lesson, you need to pay additional fee 10,000yen. If you like to take only conversation lesson, you don't need to pay this additional fee. ※Please note this is not to guarantee that you can get the skills. It depends on how much the student can concentrate on learning Japanese. We recommend our students check our free video lessons before taking our Online lessons. You need to learn Hiragana/Katakana with our free video lessons in advance if you don't know how to read them. With our online flash cards,you can check basic vocabulary and set phrase used in the class before taking our Online lessons. Flip teaching:We recommend our students check our free video lessons for each chapter below in advance so that you can learn our Online lessons effectively. We can arrange lesson curriculums as per your requests. If you do not have any requests about the curriculum, we recommend curriculums below. We can introduce these curriculums to our Japanese members(Japanese teachers,language exchange partners), so you can learn Japaneses with your Japanese teacher,language exchange partner through these curriculums. We have original textbook PDF for conversation practice. If you like, please click the letters（ダウンロード） below. 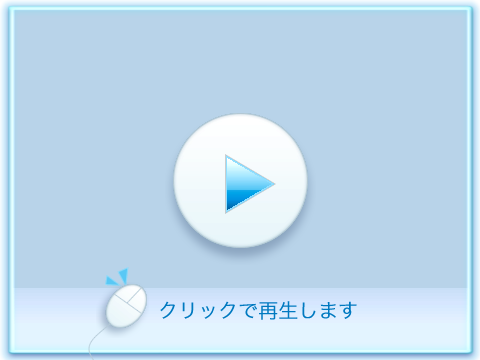 It is written only in Japanese, so It might be difficult for beginner level. Let's ask your partner!